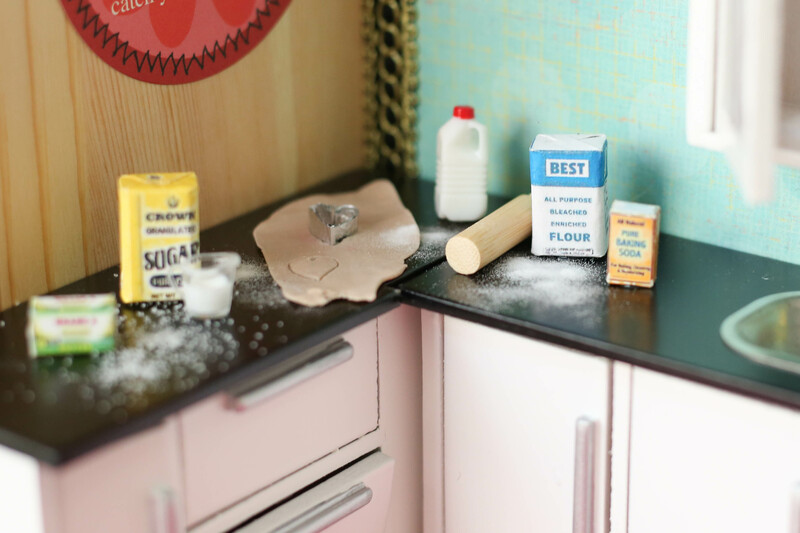 Cupid’s arrow has hit the kitchen, and it’s Valentine cookie baking madness, in miniature! My friends at miniatures.com sponsored this post that I’m sharing with you today, so please go and give their site a peek for tons of amazing miniature furnishings and decor just like the ones you see here! 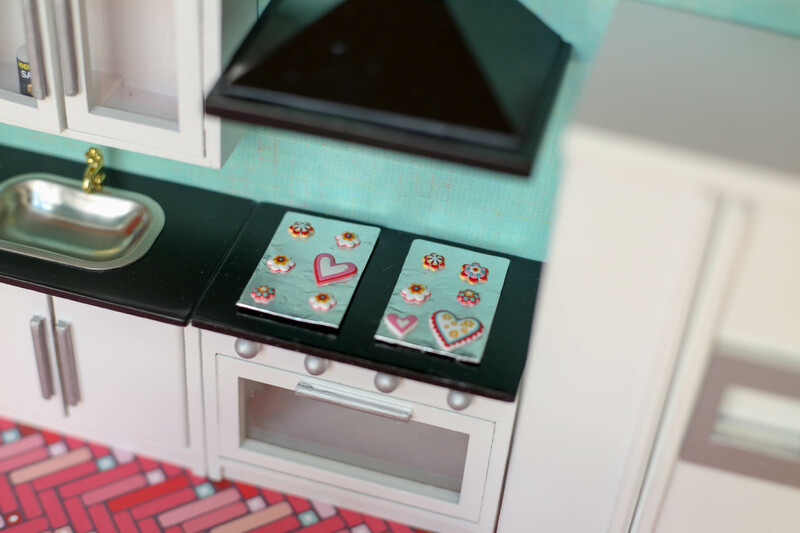 This cute kitchen scene is built into a wood box that used to house some tasty treats from Williams Sonoma. I saved it to stand on its end and make it into a tiny room, perfect for miniature baking. 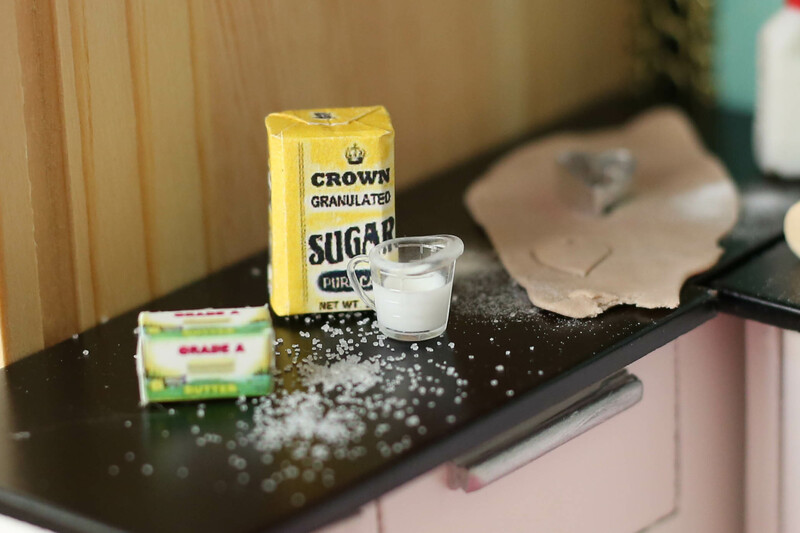 Kitchen staples like milk and baking soda look so realistic! 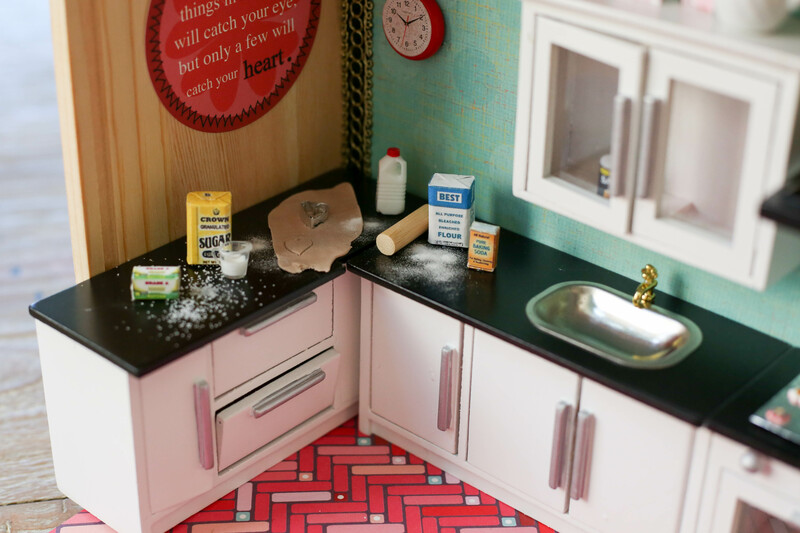 I sprinkled a little pinch of real sugar and flour onto the counter tops, so this would look more like my actual kitchen. Once the tiny mess was made, I felt so much more at home. The diminutive dining set is a charming little sight to behold. I added a runner fashioned from a strip of scrapbook paper and some white fringe trim. 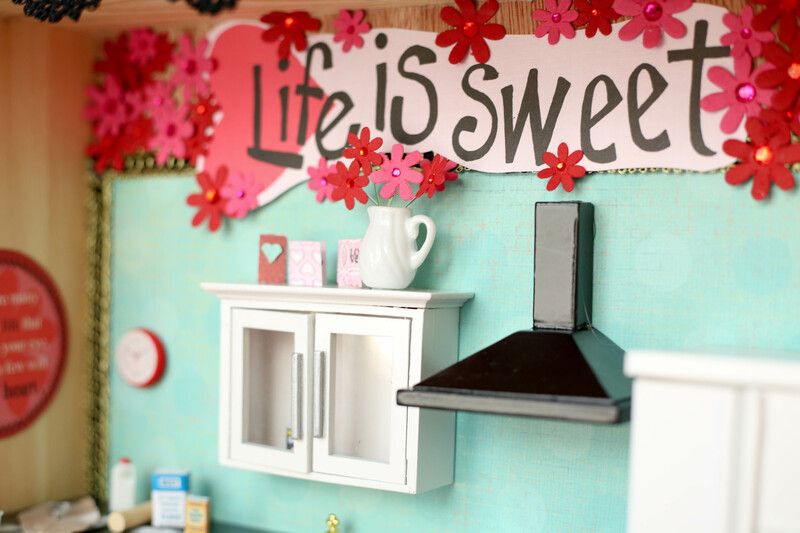 This table is all set for some tiny guests to come and enjoy the Valentine’s Day cookies that have been prepared for them. 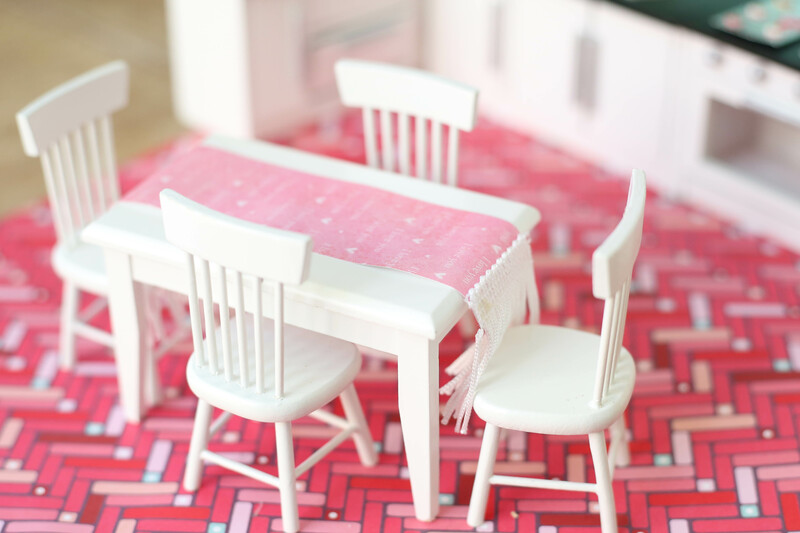 The kitchen floor resembles a cool herringbone tile pattern that adds a bright dose of cheery color to the scene. This bright look has me wishing they made this in a real tile pattern for homes. 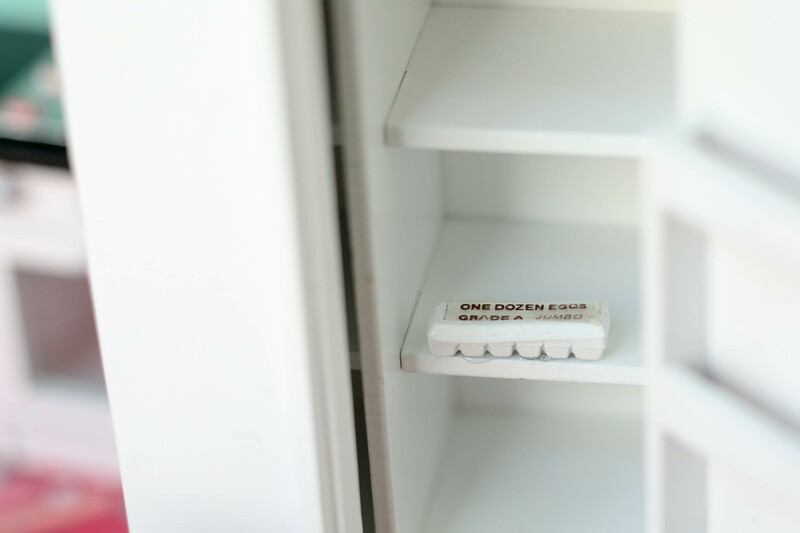 Tucked away safely on an inner shelf of the refrigerator, a dozen Grade A Jumbo eggs are ready for the next batch of tasty cookies! Atop the kitchen cabinet, a ceramic pitcher holds a bouquet of red and pink Valentine flowers. The tiny valentines were made from bits of AdornIt paper, and even have tiny messages written inside! I’m not promising anyone can actually read them, but they are hand written, I promise. The finished cookies are cooling on top of the stove, on cookie trays that were so simple to make. I just cut two equal squares of thin cardboard and carefully wrapped them in tin foil. The cookies are actually some puffy stickers I had laying around in a drawer! When you have daughters, it’s easy to come by such things. 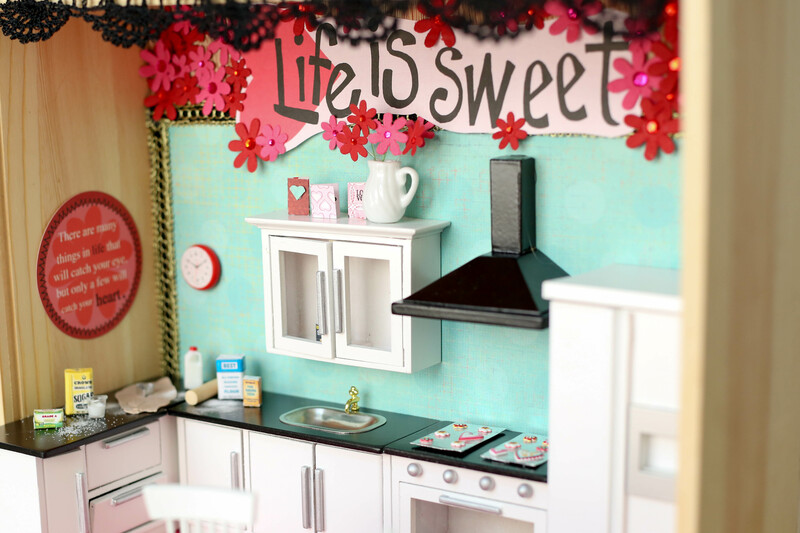 Does this tiny Valentine’s Day kitchen remind you of any fun traditions or memories? Hopefully, you felt right at home throughout the tour. For more super fun Valentine’s day minis, head over to miniatures.com and prepare to fall in love!